New Pig's IBC Containment Pallet is strength tested to ensure it meets specified maximum load capacity. 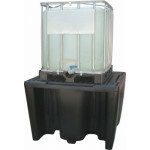 Its low-profile design it makes it easy for workers to access and dispense liquids. Two-way forklift entry allows for easy movement around the workplace when the IBC Pallet is not loaded. 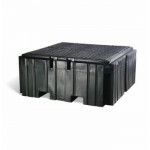 An anti-slip grate provides secure footing for workers and IBC Drum placement. For drum containment, try New Pig's Standard-Duty and Heavy-Duty drum spill containment pallets. For an IBC containment option, we offer our PIG Essentials line of IBC containment pallets.